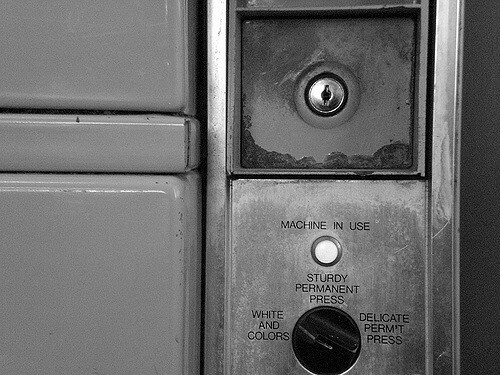 On New Years Day, I sat in the hard shell of a chair at the laundromat. I alternately felt fine and so broken that I wondered if any of the other launderers could tell. Did they see how my insides trembled as I struggled to get the washing machine handle to lock? Finally, the metal latch clacked into place, and my wavering insides smoothed down a little. As the extra capacity washer swooshed our soapy rug around and around, I wondered if this could be considered a nervous breakdown. For lots of us, the holidays represent a kind of emotional crescendo–family who we usually don’t see swoop into our lives, there’s all this uninterrupted time with our own kids, our partners. We’re suddenly unconstrained by the repetition of work and school schedules. In this soupy December mix of people and time, two things rose to the surface again and again, not unlike the soapy rug, falling, rising, falling. I feel like an outsider in my house. AJ and Jo and Cal all seem to have an emotional shorthand, a way they just get each other. I’m not in that club. I don’t love wrestling with flailing limbs or kicking balls hard and fast or watching sports. I like to walk unflinching and straight into emotional conversations, for example. I’m not great at having big talks all sideways, where you’re not making eye contact and also playing basketball. These are just a few of the things. I get triggered as hell when my kids hit each other. Especially when Jo hits Cal. And then I start buying into this story I have about how they are bad kids, and I am a failed mother. It’s a real horror show. After a good-old fashioned holiday break, getting wholloped by the old 1. and 2. again and again, I kinda lost it one day after Cal did some hitting and screaming at a new friend’s house. While the mother mercifully told me that it was all developmentally appropriate, I collapsed on the inside. Fear reached back to that trickiest time when Jo was 3. Then it sloshed forward and swept over me. Falling, rising, falling. All the hitting and kicking. Crying and screaming. Friends leaving. Nasty looks and words from strangers. Shame is a powerful currency, and it was generously paid out to me during that time. After Cal’s ill-fated playdate, I sent a distress signal to AJ, and by the time he got home, the most basic tasks felt mysterious and overwhelming. I could feel the rules that hold things together slipping away, my grasp on what to do next, how to do the tasks that need doing. Days later, after the rules slid back into place back again, I kept finding things in weird places–my coat hung up with my shirts in the closet instead of on the hook by the door, playdough in the kitchen cabinet with the peanut butter. My friend Clio told me that she thought it sounded like PTSD. The validation of that diagnosis helped. Motherhood can be a traumatic event. From my broken open, PTSD place, the 1. and the 2. demanded my attention. As for #1: AJ, Jo, and Cal and their shared interests and maleness have a very strong gravitational pull. I’ve been orbiting around them more often than exerting my own gravity. So in the past few days I’ve been building up the bulk of my own planet. Instead of the typical pillow fight, wrestle fest after dinner, I set up watercolors, because I like to paint. I’ve always told myself the story that my sons don’t like art, and just make a mess, so its not worth the trouble. I was wrong. I’m also discovering the subtle hues of what works for me in terms of physical play with my boys. I hate flailing limbs, fast smacks, big crashes near my body. But I like close, squeezey wrestling and laying on my back with Cal airplane style balancing on my feet. So it’s not that I only want to sit and do arts and crafts. But if I’m gonna hang with my boys and their physical play, I need fewer flailing limbs, damnit. As for the #2: I wrote a sign that says “Jo and Cal are good and capable,” because it is exactly this point on which I falter when they are slugging it out. When I can step between them and stop the hitting from this place, this knowing of their goodness and capability, I stay much more solid and clear instead of turning into a shame monster. I want to be careful not to write this like a problem solved, because it’s not. Like all problems, there’s a rise and a fall. A circling. But I am moving forward in solid ways. My coat is hanging on its hook, the play dough in its smudged plastic tub. And I’m settling into what it feels like to exert my own gravity. I’m a planet of my own. Wow – you just really helped me see the world through the eyes of a dear friend of mine whose son used to hit my daughter often when they were very little. I never appreciated the extent of the shame she must have felt. I am going to talk to her about it today. Thank you. And beautiful post. Good luck with your continued journey to solve #1 and #2. OH this made my day!!! So glad I can help with some empathy around this topic. Your desire to connect w your friend is so heartening. Let me know how it goes! Thank you for this! When my child has a meltdown and I feel judged and that horrible shame, and no one knows what I’m doing to help my child, which is everything! I just put out my hands up, head out of the sand and let God take over. I know what you mean regarding misplaced items! I put a gallon of milk in the cupboard when my son was having issues at school. I will sometimes put something down and forget where it is. You feel like you are losing your mind! Then you re group and start over. Some days are perfect and beautiful.. Then the kids want to kill each other and you wonder what the heck just happened! It’s like having a relapse. 4 steps forward and two steps back.. Then we start over again. Great post! Thank you for being real! I find that the holidays are particularly difficult for me because I get so little space to myself. When you are the person who is constantly reading those around you and interpreting their needs (and no, I don’t think you ever get to turn this ability off), then you are essentially going all the time. And that is exhausting. I hear you on #1 and #2 but I just want to say that I actually think that you and J have a lot more in common than you may realize. He is very receptive to what is going on around him. Maybe the hitting was actually related to that? As you know, it takes a long time to gather the skills to cope with the emotional states of others. I know I have a ways to go……..
Amazing amazing amazing. You are HELPING other parents through these deeply thoughtful and bravely honest accounts. Thank you for reminding me of our right to, and the integrity of, our own “planets” that we can carve out, create, and tend to, gently, lovingly, even while shaking inside … and the health and peace in that tending. I sense that your sensitivity, which can be so painful, is also part of the gift that forges these incredible descriptions of parenting and also makes you an attuned, caring, thoughtful parent. Your children are lucky to have you as a mother. You are not alone – I am driven completely nuts when my kids are unkind to each other and get physical – it enrages me! Thank you for giving context to situations like this, some structure and empathy to guide the way forward. I have been shaky this morning for inexplicable reasons and sitting down to do some basic paperwork has felt strangely overwhelming after a tricky morning getting my boys to school, but after reading your post, I’m ready to get to work again. Peace and power to you! Wow, Suzanne. Thank you one million times. That internal shakiness! Strange overwhelm! Two of my least favorite feelings on earth. Maybe its a sign of faltering gravity whenever we feel it–a reminder to sink into our own planet or something? Thank you thank you for all you wrote. @ahm This post was absolutely poetry. The visual imagery and word play communicated the emotion in a manner that otherwise as the father of two girls I’d not have been able to relate to. Thank you for writing and sharing this. Shame is something I’ve had a hard time relating to (and I guess I’m lucky in that regard) but based on other commentators inputs something that many moms relate to. Thank you!